Description: Second copy with less damage but worse contrast. 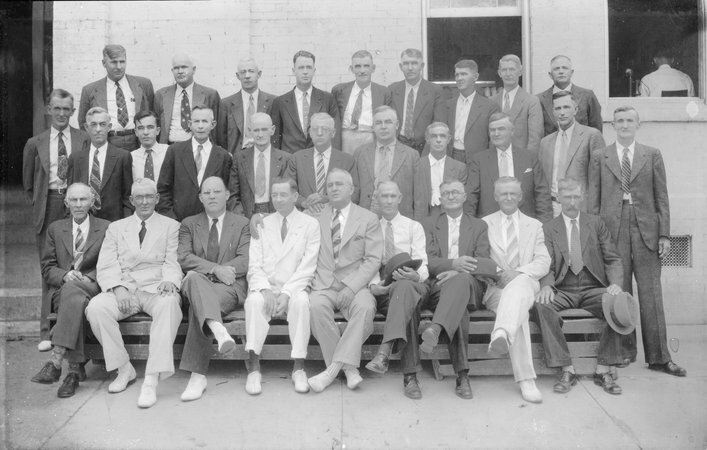 Front row (l-r): ___, Charlie Griswell, Frank Simpson, Judge Pratt, John Langley, Arthur T. Haney Sr., David Columbus Bennett Sr., ___, Oscar Cates; Middle row: ___, Tom Sysen (reporter), ___, ___, ___, ___, ___, ___ Woodruff, ___, Clark Woodruff, ___ Wages; Back row: Jim Mason (sheriff), Claude Hinton, Grady Holt, ___, ___, ___, Carlton Jordan, ___, ___. Most identified by Rhodes Jordan.